enjoyed its comfort, safety, practicality (especially hatchbacks), and highway driving manners. The year 1985 saw the introduction of the 16-valve DOHC B202 engine. With a turbocharger and intercooler, it could produce 175 hp in the Turbo 16 model (less for catalyst-equipped engines). The Turbo 16 Aero [designated SPG, Special Performance Group) in North American Markets] had a body kit allowing the car to reach 130 mph. It featured aero-dynamic side skirts, 3-spoke alloy wheels, high-speed tires, anti-sway bars front and rear, and leather upholstery. 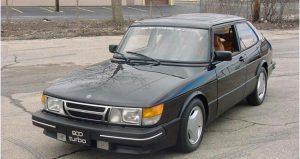 Additionally, a different grille and 3- spoke steering wheel appeared across all models A new Saab-Scania corporate symbol – featuring a crowned griffin encircled by elliptical rings – appeared on bonnet bootlid and steering wheel boss.